Went up yesterday and rode Lady again. She is quite a smart little cookie. She again declined to leave her new mom, and I had to insist. She pinned her ears a little bit at me. She reminds me a great deal of Foxy Baronessa, who bonded to her new owner like this too. To the exclusion of all others. She’s a nice filly though, and after we discussed it, she moved along and did as I asked willingly. Her brakes are good, and she steers pretty well. 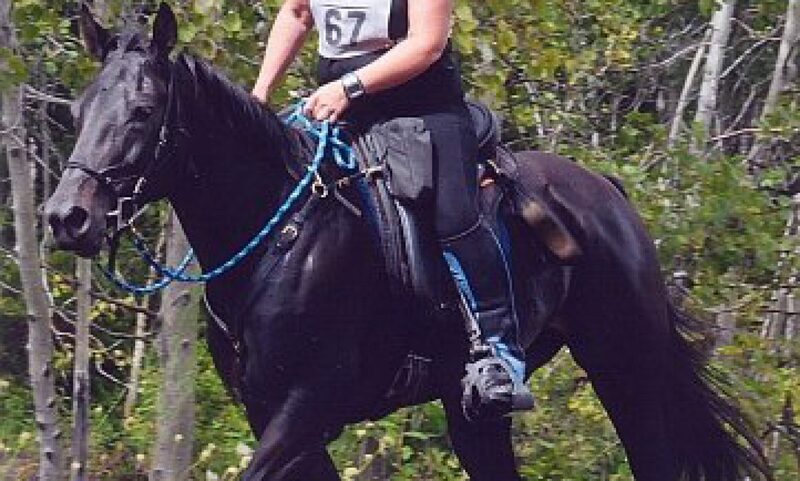 She has the typical big Standardbred walk. She seems to have no concerns about a rider on her back and stands well for mounting/dismounting. Her new owner got on her after a while. The filly was very good with her too. But has a tendency to just stand there when asked to move forward. I think that perhaps she was a bit tentative about getting after the filly to insist that she move on. When I rode her, I just went ahead and flapped my legs and pushed with my seat until I irritated her enough that she moved. Once they have gotten used to your legs against their sides, most of them tolerate pressure well. Standardbreds off the track like this are usually quite broke… they just have to get used to someone above them instead of behind, and the pressure of legs against their sides. Everything else is just a variation of what they already know. Oh, and apparently on the weekend, a fire engine went by while her mom was in her paddock with her. They went over to the fence near the road and watched it go by, lights and sirens both on. Lady just watched it with some curiosity. No spook at all. She’s a steady-minded little horse, that’s for sure. Next PostNext Nice Driving There, Buddy….